In the 1920s, Schlitz beer went from fifth in the market to a tie for first. All because a sharp copywriter named Claude Hopkins highlighted their water purification process in an advertisement. Never mind that all beer companies used the same process. No one had told that story before. Advertisers became more astute after that point, which led to the development of the unique selling proposition by a guy named Rosser Reeves. This was the beneficial feature of a product or service that the competition would not — or could not — offer. As these types of unique features became scarcer due to even greater competition, more products and services became indistinguishable. The winning difference became purely psychological, thanks to mass media message positioning in the minds of prospects. Take fiberglass insulation, a near perfect example of a manufactured commodity. And yet, Owens Corning became the market leader by focusing their messaging on the fact that their insulation was pink. Fast forward to today, more than 20 years into the Web. Any product can be replicated or reverse engineered. Any service can be copied, leaving only execution as a true difference (which comes after the point of decision). In short, people see less difference between competing offers than ever, but that doesn’t mean that they’re not looking. Search engines and social media empower everyone to take charge and figure out their own choices, regardless of your claims and positioning. With consumers, your prospect may be aware of your advertising, or completely tuned out — but they’re making choices on their own terms regardless. If you’re not showing up during the prospect’s self-determined buying journey, you’re not in the game. 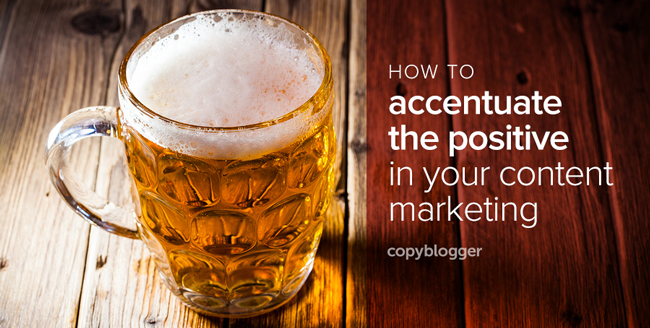 But if you are showing up via content, you’ve got a chance to tell a truly different story. Just like the water purification story made people feel differently about Schlitz in the 1920s, effective content marketing makes people feel differently about you and your offer. Even if they don’t see a difference otherwise, you’ll get the shot at proving you truly are better. And that’s more powerful than pink. Would you say then that people really care to find the differences between competing offers? Of course they care about the quality of a product. Of course they care about the value. But do they REALLY care about the messenger? Looks like they do. People like to do business with people they like, for whatever that reason may be. In an era where anyone can set up a website (and business) in 5 minutes, demonstrating your personality in a way that resonates with your audience is probably only getting more important. Finding that unique difference seems to be the tricky part, especially since markets are becoming saturated. I think that presentation can be one of the methods of making that definitive difference. For example if everyone is pumping out written content, one could offer the same valuable content as an info-graphic, audio, slideshow or video. I think most focus on text in content marketing and not the other mediums. I’ve always believed in the power of differentiation – even if your company is the exact same as everyone else’s! I think the ethos of this post is that the best way to achieve sales is to put yourself in a positive but different light from everyone else – even if it simply entails playing up something that everyone else is doing but doesn’t mention! The USP was/is a great tactic. I teach mass media and advertising courses. In essence that is what content marketing is. How can we differentiate our content? As you pointed out, those companies didn’t actually do anything different but they were the first to point out something interesting and claim it as their own. That’s one way to differentiate yourself in an increasingly crowded market but you have to beat everyone else to the punch. It’s interesting how we sometimes try to reinvent the wheel when most of the time we can simply point out something interesting that no one else has ever pointed out before. Schlitz was a great example of that. Brian, I’m glad you’re putting up these short posts. Great bursts of knowledge. Look forward to meeting you at Content Marketing Summit. If what I’m seeing from the picture here is true, one could almost say that USP is, on product level, what branding is, on a company level. Filtration ties into purity–offering the best to the customer. From the customer standpoint, Schlitz was perceived delivering the superior product. Great job on this post. I’m going to share it with some of my clients. Keep it coming. Another great article, you always have such great thoughts on content marketing. Thanks for sharing! Nice message in this article. Practicing writing headlines: “What is the winning difference that separates losers from winners in business today?” Too long? Compelling? The example given at the beginning about Schlitz is an interesting one for USP, particularly when, as mentioned, they were using the same process as their competitor. I wonder what media would be effective in accomplishing a similar outcome in today’s world of social media curated content? Are consumers as attentive today as they were then, or is it because print media was the soul source of content and didn’t compete with othe types of media for the public’s attention? Wait, so a USP can be your method of marketing, not just what you say in your marketing? The fact that a business is the only one in the marketplace producing marketing for every stage of the buying journey – that counts as a winning difference? Absolutely (but it’s really just an opportunity to say something). This is how people make buying decisions now. You bring up some interesting ideas. People are now looking more for information about a product rather than how good it looks. Having good content gives customers more trust in a service or product than just a tagline and images. I remember a story told to me in my early days as an ad agency copywriter, in which canned white albacore tuna used to be considered inferior. One company (Bumble Bee? ) sold their white tuna by saying it was “the tuna that doesn’t turn pink in the can!” It was misleading (and these days would probably be illegal), but it worked. That said…what’s your opinion of a USP that’s also a “so what”? Pink insulation isn’t necessarily any better, even if it is “different.” Is being different in a cosmetic or superficially extrinsic way enough? The author of this article really knows his ad history. But the concept of a Unique Selling Proposition has evolved since Hopkins & Reeves. And the article would be better with a few contemporary examples. Of course content marketing is the most important factor that can be helpful for your business. This is really interesting. Love the fact that if you have a story to tell and it is solving a person’s need, then your in business. The kind of virtual audience these days are mostly interested in visually-engaging content. Which is why marketers and advertisers interested in content marketing really face the challenge of figuring out what form their content should take. But of course, it still all ends up with what’s being delivered.